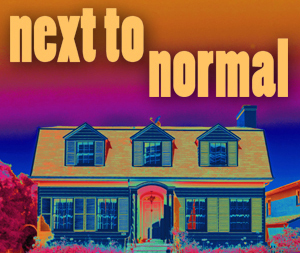 The season at SpeakEasy Stage continues with "Next To Normal," a musical that's built a cult status since it made its noise on Broadway, snagging both Tonys and a Pulitzer. So enraptured is the Boston audience that the production marked the first time in SpeakEasy history that a show extended its run before it even opened. I didn't have the opportunity to attend the New York versions (on and off-Broadway). So I went in with an inquisitive mind to see a musical about mental illness. A musical with a pop-rock score that's pretty much sung through. Bottom line -- not an easy subject, musical or not. But by the end of the performance, the audience at the Calderwood was pretty much in sync with the cult followers. We're in the suburbs and Diana is a woman on the verge. She's bipolar and the doctors can't quite get it under control, either with therapy or meds. So the next step is shock therapy. At home, her husband tries his best, but he's attempting to control that which cannot be controlled. Her daughter, meanwhile, winds up under the influence because of the influence. And her son is another story unto itself. The character of Diana has a dramatic arc to travel, but the material doesn't always support the intensity of the road upon which she journeys. She starts off with a breakdown, tries to get the help she needs, is frustrated and ends up leaving to be on her own. The score -- Tom Kitt wrote the music, Brian Yorkey the book and lyrics -- has its interesting moments, particularly in "I Miss The Moumtain" (sung by Diana) and "I've Been" (from husband Dan). To say the score is demanding on the cast is an understatement. Such that some of the vocals were a bit ragged on the high end. As Diana, Kerry Dowling (at left) has the powerful chops to do the job here. And she digs in from the get-go as the desperate wife who longs for her life while swinging from high to low. As Dan, Christopher Chew returns to the stage after a sabbatical to finish his doctorate. Although I almost didn't recognize him at first with a beard, the warm tones of his voice clicked. His is one of the most comforting talents in town, which is perfect for the role of Diana's spouse, despite the fact that she terms him "boring." As pianist Natalie, Sarah Drake has the daughter mirroring mother role. Natalie feels she was never loved, never embraced by her mother due to her mother's issues and illness. She goes off the deep end and raids the family medicine chest to take a trip of her own that leaves her isolated and angry. The plot doesn't help her when it adds the cliched crisis of a school dance. Natalie's love interest, Henry, dabbles in a little harmless smoking that soon pales in comparison to her overloaded drug experimentation. Still he cares for her and wants her to come back to earth. As Henry, Michael Levesque gives a natural and understated performance that nicely delivers a calm and a loyalty that's memorable. And as son Gabe, Michael Tacconi is appropriately manipulative as he tries to force his mother to shift focus from her own happiness to his. But even with "I'm Alive," the authors haven't given the character enough meat to convince you exactly why he's so mesmerizing. Rounding out the cast is the effective and psychopharmacologically funny Chris Caron as both Dr. Fine and Dr. Madden. Director Paul Daigneault has assembled a crackerjack team of designers for the production, starting with Scenic Designer Eric Levinson. The cool and clean playing area angles away from us, with a series of door panels that flip-flop for the characters to arrive and depart. And finally, there's the exceptional projections designed by Seaghan McKay. The artistic way in which McKay fills the stage is exceptional, from floating pills to shock waves to the psycho-babble descriptions that splash across the walls. He previously worked his magic with "title of show" and "Jerry Springer" at SpeakEasy as well as with "Big River" at Lyric Stage. In the end, we see that the neighbors next door may not be as normal as we think. Everyone's got a story, after all. Some are just very dark and complex and challenging. 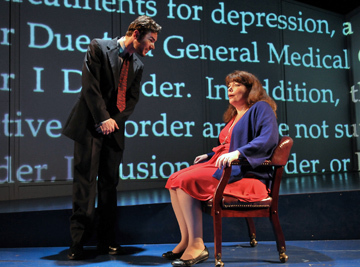 "Next To Normal's" best feature is that it tells Diana's story with respect and thoughtful deference. 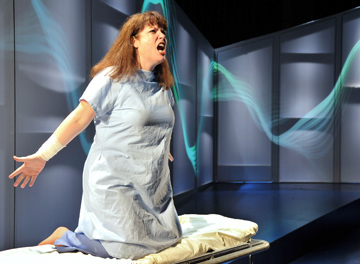 "Next To Normal," from Speakeasy Stage Company, is at The Calderwood Pavilion through April 22. For information, call 617-933-8600.